Here I'm back with a glimpse of what 'Friends n Family' cooked since I posted Part - 1!!! Microwave Khaman: My cousin tried out my recipe for making it and an honest feedback 'It was better than a ready-to-cook pack'!!! :) I would say thanks for trying out the one! Cheese Frankie: RekhaAunty (my sister-in-law's mom) cooked this yummy and colorful looking frankie, which made me drool when I received a pic! :) It looks so tempting... Isn't it?? Banana-Walnut Cake: D2 made this to celebrate a special occasion... Gattu's 1/2 yr B'day!!! :) Yey... It's a party-time tonite! Masala Dosa: I hardly work on South-Indian dishes, as I feel it takes too long to work on :P Drishti made this crispy masala dosa last week! Egg Bhurji: A gal realized she should have taken more pics of what she cooked when I asked her to share pics for this post.. Riddhi, a big time foodie made this scrambled eggs with chunky veggies! Green Chickpeas Curry: When Shalvi didn't have much of the ingredients handy, she thought of making this Rajasthani style curry for dinner! Sweet Mango Chutney: A foodie, who's too lazy to click n share a pic of any dish (actually, she can't resist for 2 mins after the dish is ready) cooked this sweet-n-sour raw mango pickle to accompany her traditional Gujju dish! 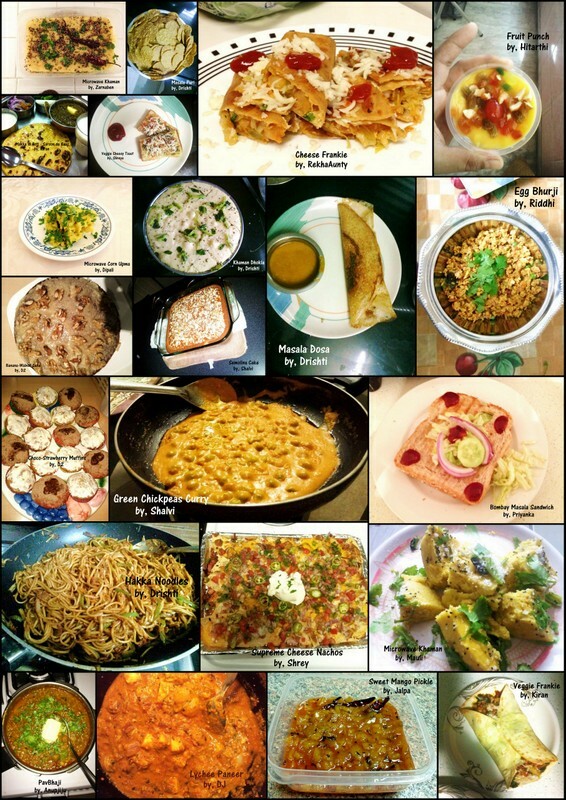 If you have pics of your cooking experiments, share them with 'SJ's Food Court' by an email... Happy Cooking!! !